The time period covering Early Dynastic Egypt is 3050 BC – 2686 BC. It is generally taken to include the First and Second Dynasties, lasting from the Protodynastic Period of Egypt until 2686 BC, or the beginning of the Old Kingdom. With the First Dynasty, the capital moved from Abydos to Memphis where an Egyptian god-king ruled a now unified policy that extended from the Nile Delta to the first cataract at Aswan. The Early Predynastic is otherwise known as the Badrian Phase — named for the el-Badari region, and the Hammamia site in particular, of Upper Egypt. The equivalent Lower Egypt sites are found at Fayum (the Fayum A encampments) which are considered to be the first agricultural settlements in Egypt, and at Merimda Beni Salama. During this phase, pottery was being made, often with quite sophisticated designs ( a fine polished red wear with blackened tops), and tombs were constructed from mud brick. Corpses were merely wrapped in animal hides. King Menes aka Hor-Aha, is considered to be the founder of the first Dynasty who united Upper and Lower Egypt. It was during this period that the divine kingship became well established as Egypt’s form of government, and with it, an entire culture that would remain virtually unchanged for the next 3000 or more years. Writing evolved from a few simple signs mainly used to denote quantities of substances and their provenance, to a complex system of several hundreds of signs with both phonetic and ideographic values. A very important change that marks the beginning of the Early Dynastic Period is the rise of urbanism. Inhabitants of small settlements throughout the country abandoned their homes and moved to larger communities and cities. Several key factors, that could vary from region to region, have influenced this process of urbanization. Evidence of temples or shrines from Predynastic and early Dynastic times are scant, except for some material from Abydos and Hierakonpolis. Shrines seem to have consisted of a matting of woven reeds attached to a wooden framework. Naturally, these things have perished through time, but hieroglyphic texts, cylinder seals and ebony and ivory tablets from the Archaic Period show representations of early shrines. 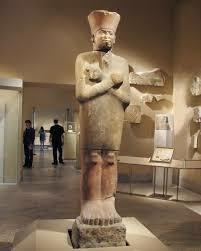 According to the historian Manetho, the first king was Menes (likely reign circa 3100-3050 BC). However, the earliest recorded king of the First Dynasty was Hor-Aha (reign c. 3050-3049 BC), and the first king to claim to have united the two lands was Narmer (the final king of the Protodynastic Period). Funeral practices for the peasants would have been the same as in Predynastic times, but the rich demanded something more. Thus, the Egyptians began construction of the mastabas which became models for the later Old Kingdom constructions such as the Step pyramid.